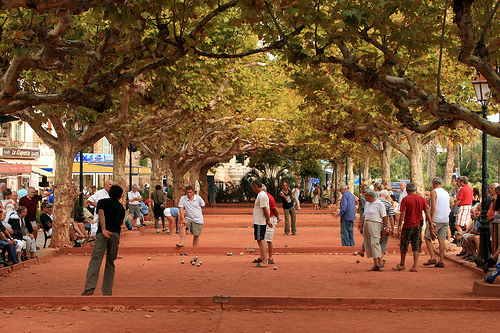 The proper term for an area where a game of petanque is played is a “terrain”. Actually the word “court” is a misnomer. We use it here because many people search for that term. Petanque is by nature a game one can play without a setup, sort of like frisbee. There are no lush fairways, sparkling blue waters or veranda bars with bistro tables and lazily swirling ceiling fans. … I regularly play on public walking paths, gravel parking lots and even empty fields — that’s why we call it a “terrain” and not a court, to signify the lack of grooming. 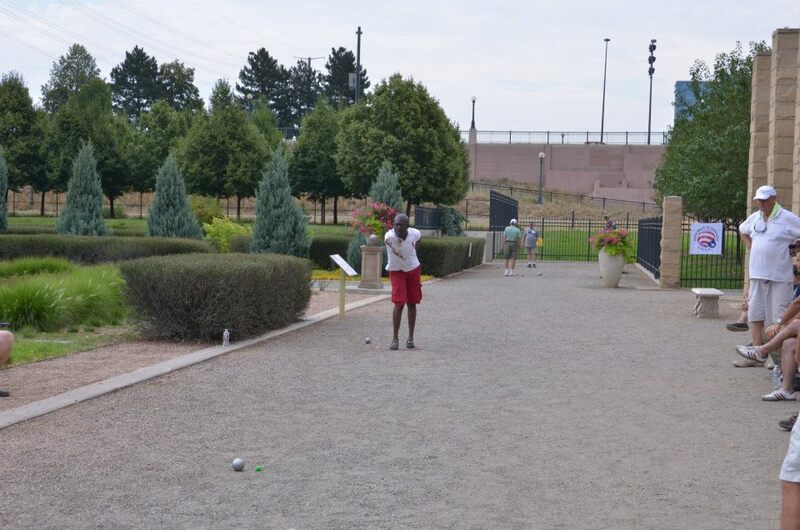 Petanque terrains don’t require water, fertilizer, pesticides or maintenance. On the other hand, although you don’t NEED elaborate facilities to enjoy petanque, there are indeed sports facilities designed and constructed specifically for the playing of petanque. Most of them are in France. They are called “boulodromes”. 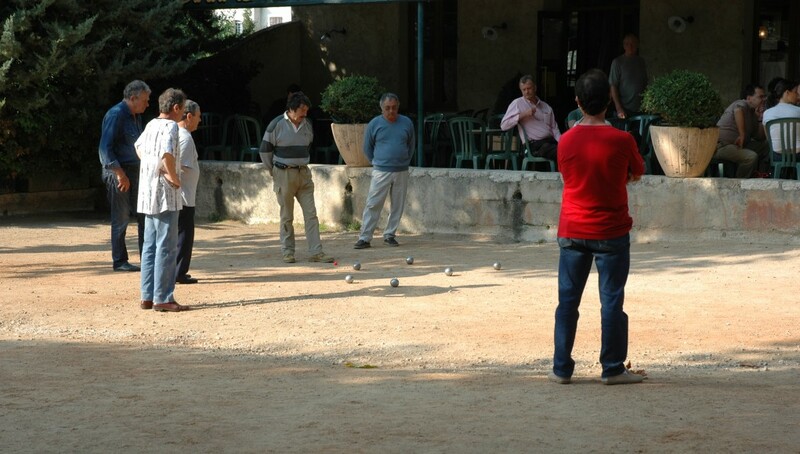 The word “terrain”, when used in connection with petanque, means simply “the area where you’re playing a game of petanque”. It doesn’t imply any sort of permanent facility. In my home town, we simply walk down to the local park and find a flat, open spot to play. While we are playing, that spot in the park is our terrain. The word “boulodrome” goes back to the ancient Greeks. “Hippos” was the Greek word for “horse” and a “hippodrome” was a facility for horse races, a race track. 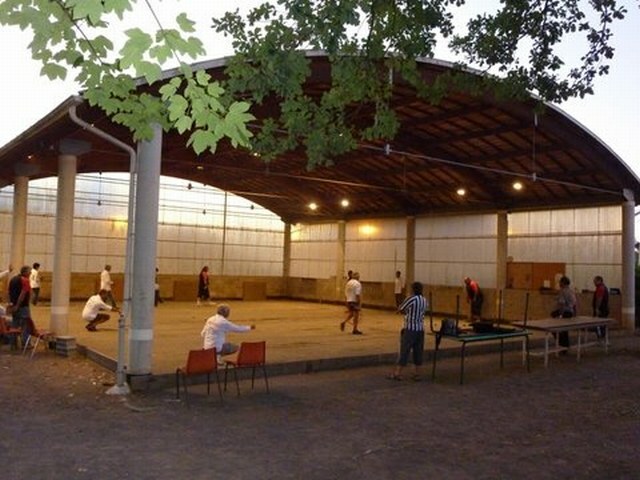 Similarly, a “boulodrome” is a facility designed, constructed, and used for playing boules. 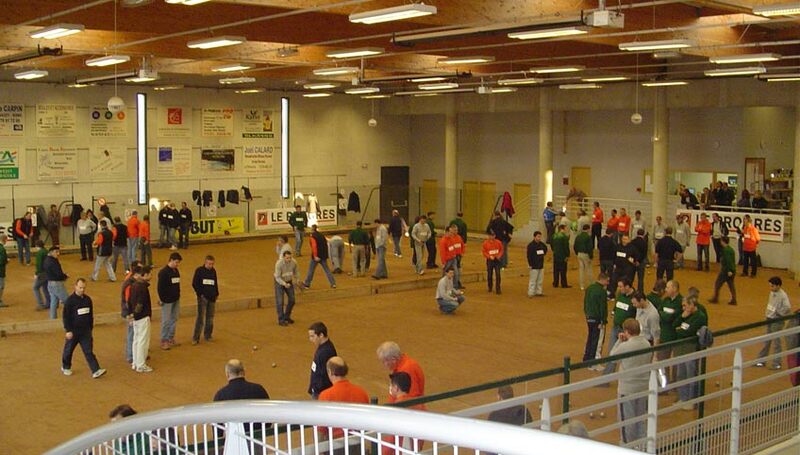 Just as a tennis facility may provide one or more tennis courts, a petanque boulodrome may provide one or more “lanes”. Like a tennis facility, a boulodrome might be outdoors, covered, or completely enclosed. An outdoor boulodrome is a boulodrome exterieur. A covered or enclosed boulodrome is a boulodrome couvert. Covered and partially enclosed boulodrome in Livinhac-le-haut, Aveyron, France. A very new and modern completely enclosed boulodrome in Bas-Bugey, France. With such a facility it is possible to play at night, and year-round. CLICK to view larger image. The English word “court” is a natural word to use when referring either to a boulodrome or to a lane (cadre or piste) in a boulodrome. 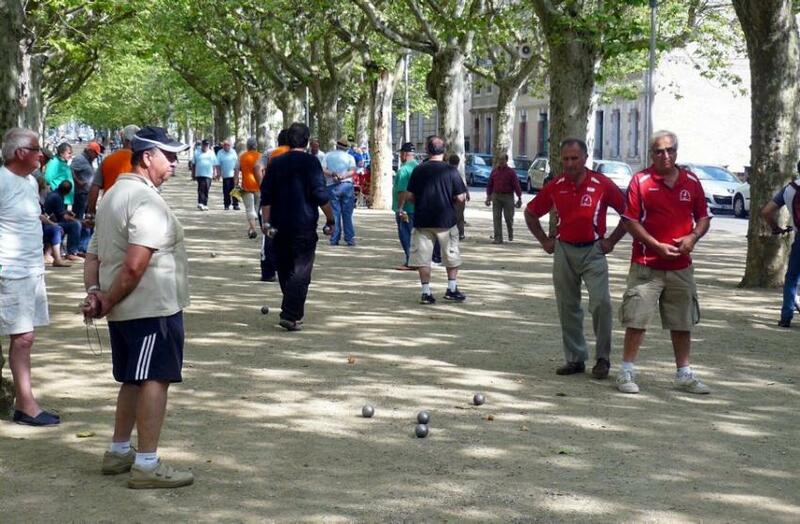 What petanque players want you to realize is that petanque DOES NOT REQUIRE a court in either of those senses. Sometimes when a petanque player insists that there is no such thing as a petanque “court”, he is trying to make the point that you don’t need a court to play petanque… the way you do with bocce. In the United States there are many more bocce players than petanque players. The Italians simply got to America sooner, and in greater numbers, than the French did. So when it comes to public funding, bocce gets all the visibility and all the money. To American petanque players, that seems unfair. And also stupid. I’ve just read The Joy of Bocce, where the author advocates the construction of bocce courts in schools across the United States. That’s the typical “bait-and-switch” tactic of bocce promoters. They hide the fact that bocce requires extremely expensive, high-maintenance courts. I have seen public bocce courts in California and Oregon that cost thousands of dollars to install, and after months of lack of maintenance have become completely unplayable. 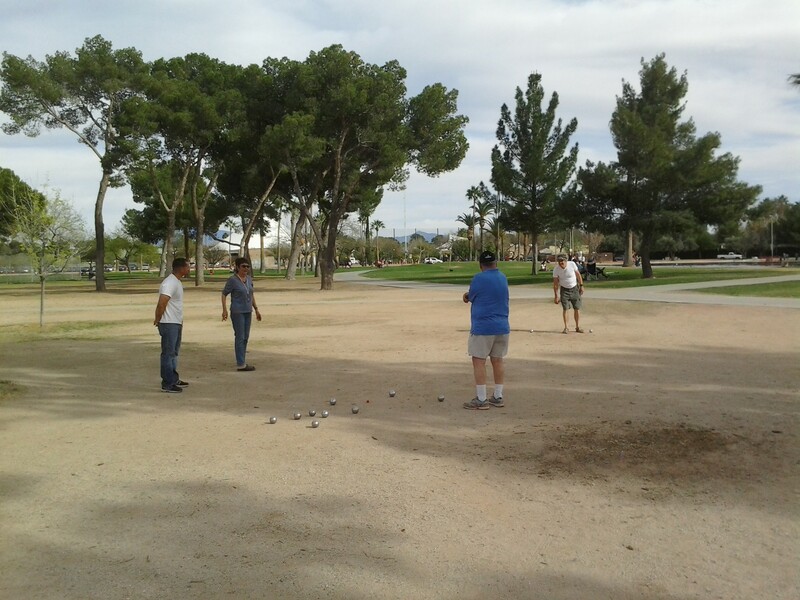 Petanque is played on hard dirt with a little crushed rock (D.G., decomposed granite). 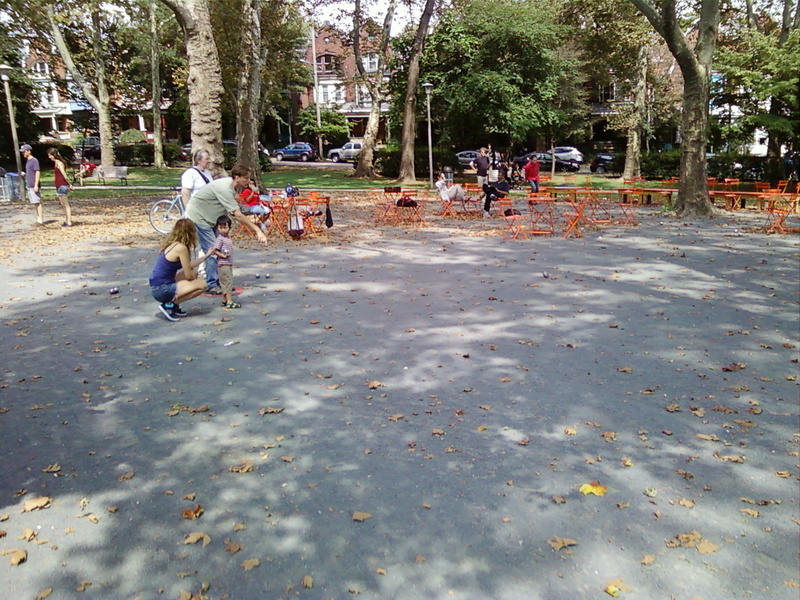 Many public parks have open areas or paths with exactly this kind of surface. These areas are essentially maintenance-free. They are perfect for petanque, and they are also available for general public use. Why spend huge amounts of money to build dedicated bocce courts that require expensive ongoing maintenance, when for pennies on the dollar school and city officials can create multi-use, virtually maintenance-free dirt and D.G. terrains?